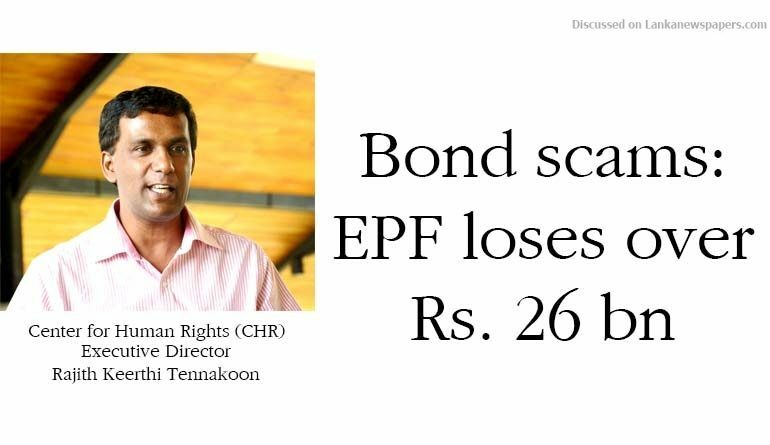 The total loss incurred by the Employment Providence Fund (EPF) due to the bond scam alone is over Rs 26 billion, Center for Human Rights (CHR) Executive Director Rajith Keerthi Tennakoon said yesterday addressing a press conference at Rajagiriya. Tennakoon added that from the transaction, LKB 02035 C155, alone Perpetual Treasuries made a profit of Rs. 2.66 billion. For the seven transactions Perpetual Treasuries spent Rs. 52.82 billion and resold the bonds to EPF, within four and five days, at Rs. 79.14 billion. Senior Banker Rusiripala Tennakoon, who also addressed the press briefing said that, based on this new evidence, the total loss incurred by the bond scam is far greater than Rs. 12 billion estimated by the Auditor General and the Presidential Commission of Inquiry (PCoI).